CANTON, Mass. (May 28, 2013) – Thousands of ice cream enthusiasts throughout the country competed to be named the winner of Baskin-Robbins’ Third Annual Create Baskin’s Next Favorite Flavor Contest. After tallying the online votes, Baskin-Robbins today announced that Liz DeCecco of Eastchester, New York has won the online contest with her creative and fun ice cream entry, OREO® Cookie Dough Obsession. OREO® Cookie Dough Obsession, which is planned to be featured in participating Baskin-Robbins shops nationwide as a pre-packed quart this December, is a delicious combination of chocolate fudge ice cream swirled with a whipped cream ribbon, combined with cookie dough and OREO® cookie pieces. To celebrate her winning flavor, Liz visited Baskin-Robbins’ West Coast training center in Burbank, California last week, where she spent a day with the Baskin-Robbins culinary team to bring her virtual ice cream flavor to life. 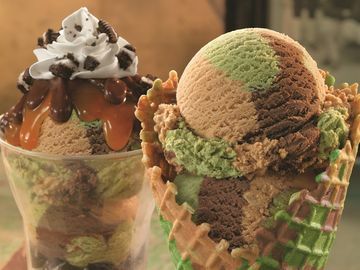 The Create Baskin’s Next Favorite Flavor Contest began in October 2010 and asked consumers to mix and match their own ingredients to create a signature ice cream flavor from 31 base flavors, a variety of ribbons such as fudge and peanut butter and an abundant amount of mix-ins including candy pieces and cookies. Ice cream fans voted from the top 10 favorite flavors and chose the winning flavor, OREO® Cookie Dough Obsession. For more information about Baskin-Robbins’ wide variety of ice cream flavors and frozen treats, visit www.BaskinRobbins.com or follow us on Facebook (www.facebook.com/BaskinRobbins) or on Twitter (www.twitter.com/BaskinRobbins).